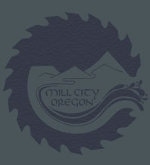 Mill City was founded in 1886, and was named after the Santiam Lumber Company's mill on the current city site. Mill City was incorporated in 1947, and currently boasts a population of some 1,885 residents. The Canyon Life Museum on Wall Street is a good starting point for anyone interested in photographs and history of the booming lumber mill days. The City is subdivided by the scenic North Santiam River; north of the river is Marion County and south of the river is Linn County. The two dams that control the river flows are well upstream from Mill City, which means great salmon and steelhead fishing and lots of river recreation. For those not familiar with the river, we suggest you consult with one of our local river guides. There are falls and rapids that can mean lots of fun, but do it safely with a knowledgeable local guide. Developed parks, trails, water recreation, surrounded by mountains, and only 30 minutes from the state capitol building in Salem. Sound too good to be true? Come see for yourself. In the 1980's Mill City was a bustling timber town but changes at the state and federal levels impacted the timber industry and had a major impact on our small community. We are now fighting our way back from this economic fall and making huge strides. For a small taste of how the changes affected Mill City view the following OPB video.